To commemorate the 50th anniversary of Federation and Australia acquiring the status of a nation, the Victorian Government in cooperation with the Commonwealth Government commissioned a Jubilee Train. This train visited most towns on the Victorian Railway system during the first half of 1951. 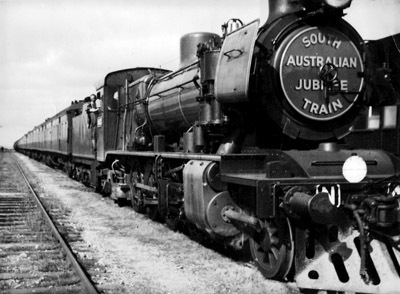 The South Australian Jubilee Train at South Hummocks, August 1951. The SA Premier, Sir Thomas Playford, saw the benefit of this train, and arranged for it to be made available to South Australia. Set up and operation of the Jubilee Train was managed by a Jubilee Committee. This committee appointed Mr R. DeLance Holmes as administrative officer of the train. He was responsible for all liaison between railway staff, state, and commonwealth personnel. The aim of the Jubilee Train was to promote to people living in South Australia’s urban, rural and regional communities, the role of the 16 South Australian and 6 Commonwealth Government agencies participating. It comprised 10 carriages containing various exhibits, models, pamphlets and promotional materials. Each Department was represented by at least one officer (see list of exhibitors). The officers were on duty each day (except Sunday’s) to answer questions from members of the visiting public and give a description of the working models on display. In the main, the exhibits illustrated the great progress that had been made in the 50 years of Federation. Emphasis by SA agencies was placed on agriculture, mining, forestry, and especially the large growth in manufacturing and new industries that were being intensified since WW2. The main Commonwealth focus was on defence, immigration and postal services. For country tours, the main 10 carriage “display” train was accompanied by a second train to provide accommodation and support facilities for staff manning the Jubilee Train. The support train comprised 3 “Carey” sleeping cars and 4 vans, one of which contained cooking and ablution facilities. Both trains were equipped with generating sets for the supply of power for lighting and to operate displays. The Jubilee Train was hauled by a Class 430 steam locomotive. In addition to the SA Railways staff who drove, maintained and operated the trains, there were approximately 40 personnel associated with manning of the displays. The Jubilee Train’s tour commenced on 30th July 1951, and finished on 8th October 1951. It visited 66 country towns connected to South Australia’s broad gauge railway system. Planning of the itinerary involved a tremendous amount of work by specialised officers of SA Railways so that movement of the trains could occur between regular rail services. Return to Islington Railway Workshops for recess and overhaul of trains and displays. No 2 Tour to southern districts and Murraylands. The majority of Government departments selected and deployed staff for week or fortnight periods. Mr Trevor Roberts was the Department of Lands representative for the full term of the Jubilee Train tour. He had a good understanding of dry land farming practices, but his knowledge of crops and irrigation techniques in the upper and lower Murray were limited. To overcome this, management sent Mr Roberts on a study tour of pumping stations and irrigation activities at Loxton North and Cooltong under the guidance of Cedric Steed and J.W. Gilchrist (senior officers based at Berri District Office). Mr Rowland Hill of the Land Development Executive also arranged for Mr Roberts to visit the Fairview Estate and Eight Mile creek projects. These visits provided a better appreciation of Lands Department field work being undertaken in the Murray irrigation areas and the South East. Full time officers on the Jubilee Train were allocated a personal sleeping cabin fitted with bunks, desk and wash basin. These were quite comfortable. Each week the train porter issued each member 2 clean sheets and pillow cases, a large and small towel, and soap as required. Dining was often at local hotels, although in some locations meals were provided by the local branch of the Country Women’s Association (these were considered feasts) or local council. With such a large group, staff normally marched in an orderly fashion to the local hotel. Often two sittings were required to accommodate the number of officers. Models dealing with drainage and reclamation of land in the South East (Eight Mile Creek), and the development of irrigation schemes along the River Murray. Special attention was also drawn to the exhibit of maps and photographs that described the work of the Land Development Executive. The Executive were responsible for acquisition, clearing and subsequent allotment of land to WW2 Soldier Settlers. Much of this land was in safe rainfall areas of the South East, Eyre Peninsula, and 300,000 acres (120,000 ha) of Crown lands on Kangaroo Island. Maps prepared by the government photo lithographers showing the position of the Dog Fence extensions. These ran 2,200 km from the coast at Fowlers Bay to the NSW border. The dog proof fence was maintained by the Dog Fence Board and the Vermin Branch of Lands Department. Information about the introduction of modern mapping techniques using aerial surveys and photogrammetric maps. These enhanced survey techniques were very important for land settlement. 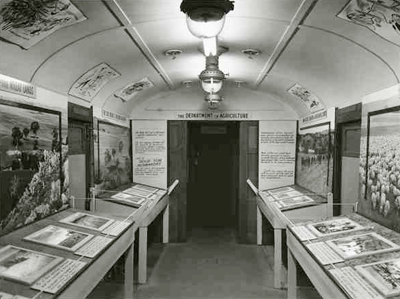 Part of the Department of Agriculture’s exhibit on the SA Jubilee Train, 1951. The visit of the Jubilee Train was a special event in most rural locations, with exhibits often being crowded all day. A puppet show engaged by the Jubilee Committee accompanied the train and was undoubtedly the most popular attraction for thousands of school children. In Burra, some 1,800 people visited the Jubilee train on the weekend of 14th August 1951. The Burra Record newspaper reported that queues of people waiting to visit the train were the largest seen in Burra’s history. The displays illustrated to towns like Burra the outstanding progress that had been made in the fields of agriculture and mining. The Royal Australian Navy exhibit also proved a highlight. It displayed a sectionalised model of the recently arrived light aircraft carrier, the HMAS Sydney. Also on display was a representation of the HMAS Condamine, a frigate attacking a submarine with depth charges. In all, it was recognised by the SA Government that the Jubilee Train exhibits were of intense value and interest to the rural population of SA. Special thanks to Ms Moama Colmer, Curator, SA Railway Museum, Port Adelaide (Ph 8341 1690) for her assistance in sourcing details about the Jubilee Train itinerary, locomotives and rolling stock. “The Jubilee Train – Sponsored by the State Executive Committee of the Celebrations in SA (PDF 8.1 MB)”. Jubilee Train tour program (PDF 172.9 KB) and describing the rolling stock used. The State Library of SA also has on its web site ( www.slsa.sa.gov.au/ ) a comprehensive set of photographs of the displays used on the 1951 Jubilee Train. This article has been prepared by Mr Trevor Roberts, who was employed as a Clerk in the Lands Department, and was the Lands Department representative on the Jubilee Train in 1951. Mr Roberts subsequently became the Senior Administrative Officer in the Department of Agriculture, retiring in 1986.